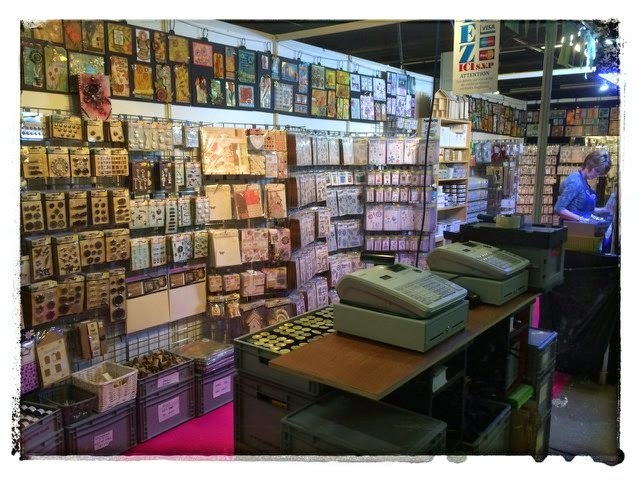 Good evening everyone, or should I say 'Bonsoir'.. Leandra here, bringing you some highlights from Version Scrap This is the International show of Paper Art, Scrapbooking and Crafts and runs 4th to 6th April at the Parc Floral in Paris. Version scrap is an absolutely relentless show to do as an exhibitor. We have a stand slightly larger than our Ally Pally stand, and we have 7 staff. Jonathan, an American student studying in France as Mr security, Dounia, a French student finishing her doctorate in the chemistry of art restoration processes who does all the Make and Take programme, Sally, an English lady who lives in France and is translator/ re-stocker/ knowledgeable one on all things Paris, Lin Brown and Leandra demoing, and Mark and Audrey (the lovely daughter of our French distributor from many year ago) are on the tills. It's a great team and each and every person works their socks off from 8 in the morning until 8 at night each day. We fall into bed around midnight, get up at 6 and do this for 4 consecutive days. Wednesday saw us up bright and early. After 6 weeks of manufacturing and a whole week of wielding a price gun, the van was packed and we were on our way. 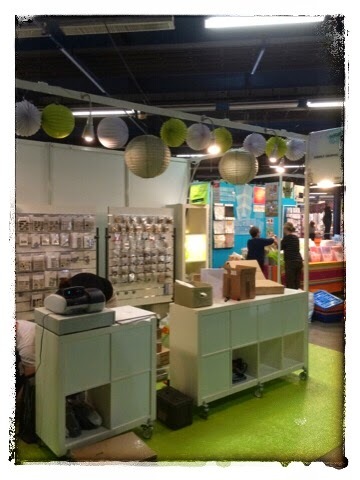 We had hoped to set up the PaperArtsy stand nice and early, but it wasn't to be. No worries, it meant that we could check into our hotel and relax before having a lovely evening meal with Sally. Thursday became our set up day. Wow who packed all this stuff? So excited to be bringing lots of new products to the show. After so many years doing shows we have a set up routine, and even though it meant a 7am start, everyone pulled together and got the job done smoothly. 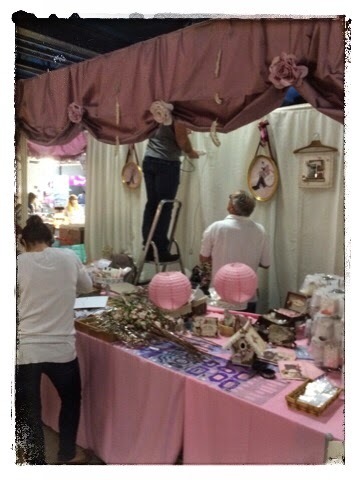 I managed to sneak away to have a look at the other stands, all busy with their own preparations. This year the show is double the size due to the addition of a sugar craft show, so it's no wonder the number of visitors increased accordingly. Next door there is also an amazing farmers market show where the food is amazing. Mark usually sneaks off for lunch with Christian, Audrey's papa (I think it might also involve a sneaky red vino) and saunters back late afternoon with bags of amazing jams, hams and saucisson. The Europeans have such a wonderful talent for stand design, product display that it puts English shows totally to shame. The show organisers have bright turquoise, lime green and hot pink carpet to denote different sections of the show (scrap, sugar craft, workshops) which gives a fresh modern vibe. Stand exhibitors signs are like flags, seats are futuristic pods atop circles of carpet, even section walls are all fabric in the same colours. Signage matches the colour schemes, and there are cute signposts telling you where everything is. All this attention to detail sends a strong branding message for the show as a whole. 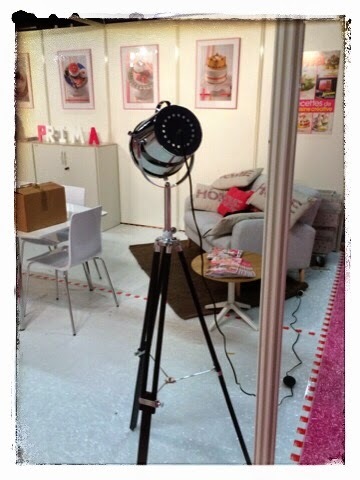 The thing that always strikes me is how elegant the stands are and how much attention to detail the exhibitors put into the presentation of their products. Many stands are minimalist but colour, display, and decoration are always superb. Just look at this wall for instance. 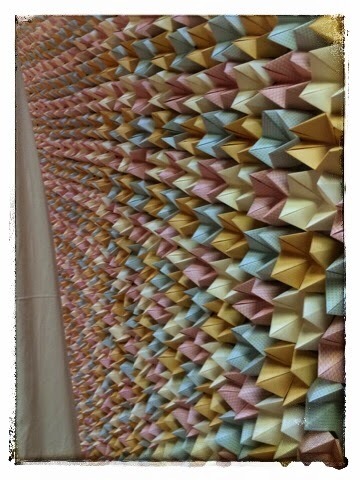 The whole wall is individually folded pieces of patterned paper. Thursday evening is a V.I.P preview evening, open for people who booked classes, and in addition, each stand gets given a number of tickets to issue to customers based on the size of the stand. We are asked to make available special offers just for that evening, limited edition products etc. regardless, It's a LONG day. During the evening Lin and I made samples, here are mine, lots of layering, text and stencilling. A couple of embellies and the ever versatile wooden spool, really add dimension and bring projects to life. Here are three of Lin's samples. This first one shows the fabulous new Hot Picks stamp 1301. 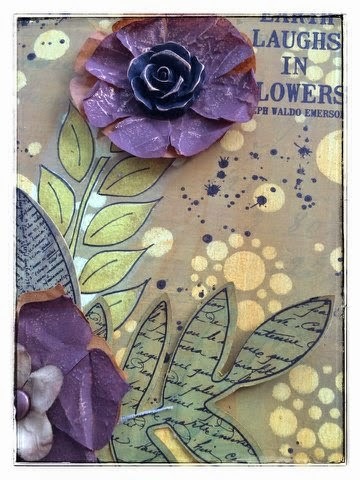 Here, a combination of Eclectica³ Ellen Vargo's stamps and Eclectica³ Lin Brown stencils. 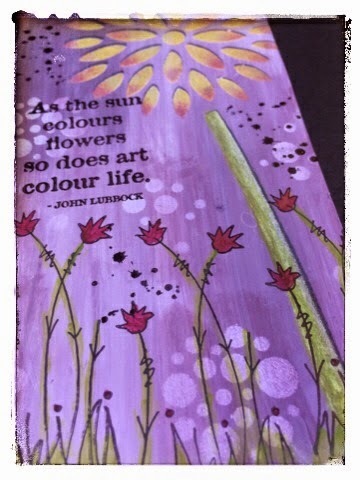 Here Lin used 2 of her stencils and some JoFY stamps. Friday saw the show open properly, Lin and I were soon busy making samples. It is always such a pleasure to show people how to bring together small pieces of art. Here are a few of the samples that I made. This one utilizes JoFY 10, a definite favourite and ideal for colouring in. 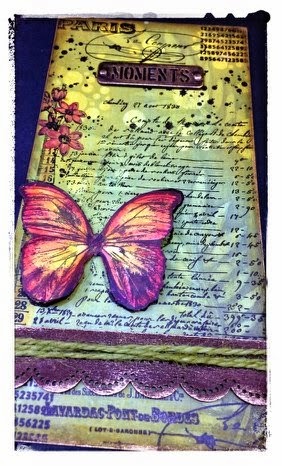 This one combines the new JoFY stencils and the new JoFY 23 stamp. We were thrilled to see some of the UK #PAtwits at the show, the lovely Lin,Helen,Sam and Emma came to see us and snapped this photo of me and Lin. Working hard, but we always have time to chat to customers and answer questions. 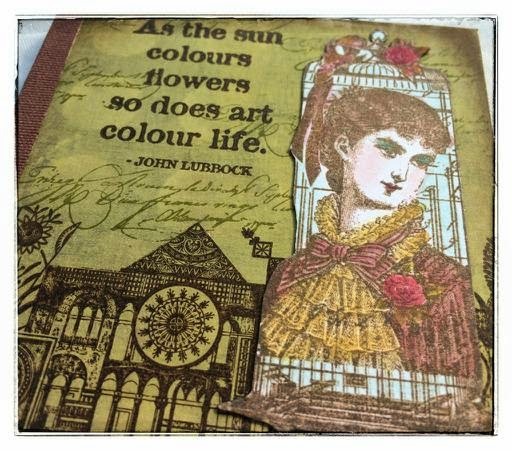 Here are some of the samples that Lin made throughout the day, combining her stencil and the scratchy circle stamp from Eclectica³ Ellen Vargo. 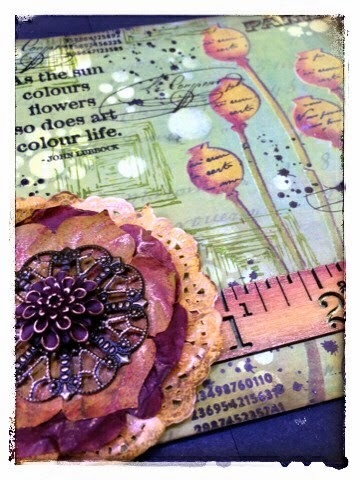 Another sample using the beautiful new stamp by Lynne Perrella. While we were busy at the demo tables, the wonderful Sally was an absolute star and kept very busy restocking the shelves. Meanwhile Dounia did a really great job, working with customers on these make and take projects. This morning the make and take project focused on the new Lynne Perrella stamp collection. After lunch, the make and take project changed, and the focal images came from the new Eclectica³ Ellen Vargo collection and the new Steampunk houses by Eclectica³ Darcy. I did not get time to walk the show today ( I stopped for lunch at 6.15pm) but I am sure some of the English ladies who came over this year will have plenty of photos to show you, when they blog, I will come back and put the links to their posts here. Workshops with French and international crafting teachers are on offer all day long, usually 3-4 hours in duration, so something to get your teeth into. Here are some of the UK ladies at a workshop. Sam has blogged about her journey here , and her day at the show, doing workshops, here. Helen has blogged lots of great photos here. This afternoon the make and take project swapped, and this time the main images used were from Eclectica³ Lin Brown. On Friday and Saturday the show is open from 9 am to 7pm, and on Sunday, 10am to 6pm. Then we have only a couple of hours to break down and get out. One year we drove home immediately after the show because Mark's parents arrived into Heathrow at 6 am Monday morning, but now we know the best thing is to collapse back at the hotel on Sunday night, then drive home Monday when we feel slightly more human! But despite the absolute slog, it is a beautiful show and one we enjoy very much, well my head and heart more so than my feet!. I think what we do is very 'out there' for the more usual bright crisp or shabby-chic muted style of French scrapbookers, but after 6 years at this show, we now have a solid bunch of French, Spanish, and Italian groupies who attend the show just to see us, and they are très géniale! 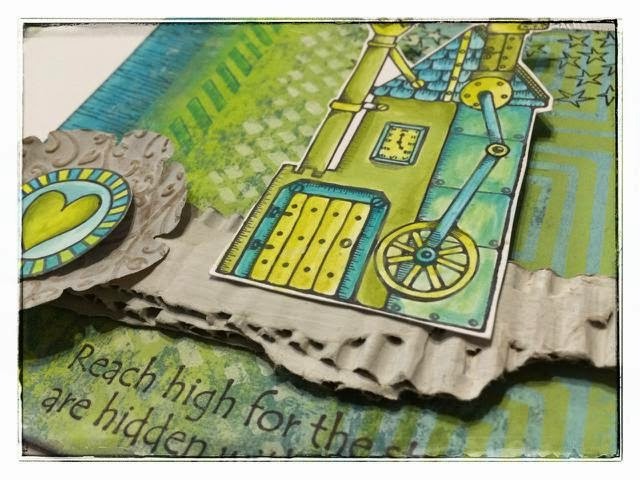 This year, as the style of the show is very much scrapping, I was not surprised to see the Prima cartographer paper collection disappear off the shelves so fast, but so did the mechanicals embellishments, Lynne Perrella stamps, and the new Hot Picks. And they adore Treasure Gold, that generates many ohhs and ahhhhhs! We had it last year too, but they are still snaffling it up like all good little craft piggies do! .If you ever get the chance to come over to Paris for Version Scrap you should, nothing wrong with a spring time weekend in Paris, and if you get a craft fix at the same time, then what a great bonus! A big thanks to Darcy for editing this post from me and hopefully making sure it doesn't read like the gibberish manner I feel I am typing in! Oh, and I have ordered a secret new product this morning from one of the other exhibitors, that you will like a lot and we will show you at Ally Pally, and I have already reordered much of the stock that sold out today for Ally Pally which I pray will arrive before Thursday! Wish I could be there too, as I'm away in Turkey for Ally Pally...maybe next year! Great photos & samples Leandra & Lin! Oh I so wish I was there! I know it is hard work for all of you but I hope you enjoy it. I can't find much interesting stamping stuff when I am in France; it is mainly decoupage and scrapbooking so I bet they really love your stuff!! (did you really call us all 'craft piggies', lol!). Sorry!! The quadruplets!! Wonder of Paris will survive ! The stand looked fabulous Leandra. I don't know how you keep going at that rate but I bet your Europian groupies really appreciate it. I gather from all the tweets that the PATwits have been having a smashing time. How dare you sell out of some of the goodies before next weekend ;D! Hope the restocks arrive in time as I've been waiting for a good old spend. Looks like it all went well. Bien fait! I will get there I really will. Great post. Glad you had a great show although it sounds exhausting. I cannot imagine the logistics & hard work that goes into getting this show up & running, no wonder you're exhausted by the end. A VERY wise decision to get a night's sleep before tackling the journey home. Enjoy today & have a safe journey home tomorrow. I'm there next year, looks great! My daughter will be doing 6 months in France as part of her degree. Hopefully an easy ride to the show! Some super makes, got me all inspired to make something NOW! Such hard work - but looks so worth it! Couldn't make it this year, but it's definitely in my plan for next year... Hoping there are some new Hot Picks left for Ally Pally!! !